My second night of camp grounding. I decided I would find a place to stay for the night and checked my app that tells me of all places from free to pay. I called a couple nice looming state parks and they were both full, so I decided I would look for a Walmart that my entertain overnights. My software said none in the area did. My next choice wes to call private campground and they had a place after qualifying what I had for a vehicle. I asked the price and the the woman said $66.00 with full hookups. I asked what about no hookups or just electricity and she replied that she is required by FL law to first fill lots with hookups before using overflow space without. Those that know me my interest is sparked as soon as someone says it's the law. Well, I said I would stop by as it was right down the road. I went to the office and there was the young woman I had spoken with. 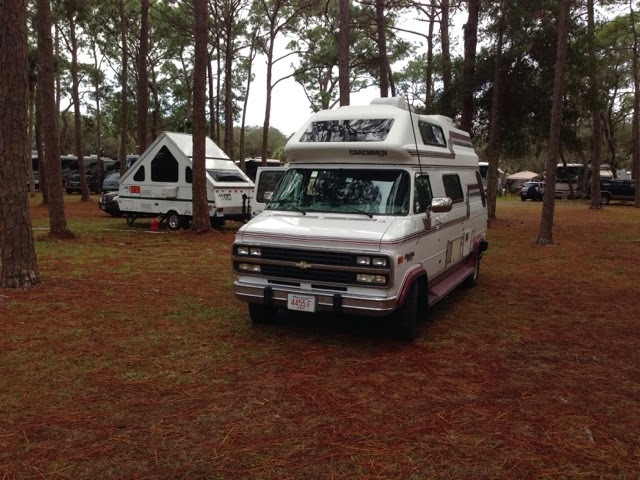 She looks at my camper van and said you are right our motorhomes pay the $66 and I can't charge you that, so I can put you in the overflow with the tent trailer and there is water and electricity near buy if your coward is long enough for $33.00. This has been a problem I have been having. I'm in what is classified as a motorhome but can fit anywhere and don't need services other than the restrooms. This is a problem looking at future bookings too. All I need is a parking space and I am good.